China Huarong Asset is part of Financial Services business, which is part of Financials industry. China Huarong Asset is a company from China, and his stocks are publicly traded. China Huarong Asset paid a total dividend of 7,423 million HKD last year, for a market value of 55,870 millions (Market Cap 13,854 millions). Dividend per share of China Huarong Asset is 0.19 HKD, and his stock market price 1.43 HKD. 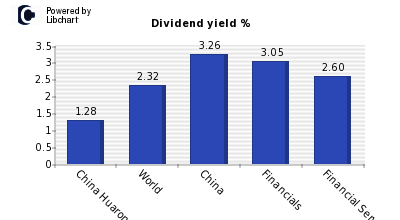 According to the chart below, where dividend yield is displayed, China Huarong Asset has a dividend yield of 13.47%, which is higher than the amount offered by both the market average and companies from China. It is also bigger than average of Financials industry. This high dividend yield might be a sign to worry about the future of the company so deeper analysis is needed. In addition, you should compare China Huarong Asset dividend yield with other Financial Services companies or firms from China. About the ability of China Huarong Asset to maintain his current dividend of HKD 0.19 per share, an amount that accounts for 13.47%, we should study its payout ratio both on earnings and on cash-flows (see chart below). China Huarong Asset payout on ernings is currently 45.24%, which is higher than the market average, but lower than companies of Financials industry, which are 40.41% and 45.44% respectively. Both figures show that China Huarong Asset should not have problems to continue paying his dividend. The payout on earnings should be complemented with the payout on cash flow since it is this last amount the one which can be distributed to shareholders. Cash flow per share of China Huarong Asset is HKD -2.38 per share, which is lower than the dividend per share paid by the company of HKD 0.19, so the company does not generate enough cash to maintain his dividend in the future. The following figure shows payout ratios over earnings and cashflow of China Huarong Asset, compared againt world market average, China companies, Financials industry and Financial Services sector companies. Finally, last moth China Huarong Asset showed a return of -11.20% compared to a worldwide -5.60% average, and a -5.58% of Financials firms. Over the last year, the company obtained a -61.20% versus a worldwide performance of a -11.41%. More detailed information can be seen in the following graph for China and Financial Services firms. China Huarong Energy. Hong-Kong. Industrials. China Huishan Dairy. China. Consumer Goods. China International Marine Containers . China. Industrials. China International Capital. China. Financials. China Jicheng Holdin. Hong-Kong. Consumer Goods. China Jinmao Holding. China. Financials. China Hongqiao Group. China. Basic Materials. China Gas Holdings (. China. Oil and Gas. China Galaxy Securit. China. Financials. China Foods. China. Consumer Goods. China Everbright RC. China. Financials. China Everbright Int. China. Industrials.